Bank Negara Malaysia may make it harder for Malaysians to buy more than two houses as it seeks to stem speculative buying that is pushing up property prices. Sources said the central bank would be meeting with banks next week to discuss plans for a mortgage cap whereby loans would be limited to a portion of the property value. "The expectation is a cap of about 70-80 per cent. We think a directive will be issued to cap," said two sources with knowledge of the meeting. Earlier, Bank Negara Malaysia governor Tan Sri Dr Zeti Akhtar Aziz said it was prepared to take pre-emptive action and that it has wide-ranging instruments to prevent a property bubble. "We want to promote house ownership, but we want it to be done in an orderly manner and we don't want speculative activities," she told reporters on the sidelines of the Global Islamic Finance Forum in Kuala Lumpur yesterday. She acknowledged that there may be pockets of bubbles forming in parts of Malaysia, but believes Malaysian banks are dealing with this through their own risk management process. 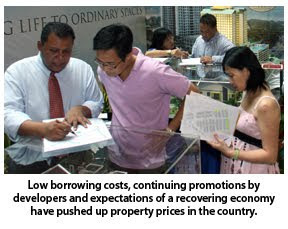 Areas like the Klang Valley and Penang have reported strong property demand. In June this year, some 147 double-storey terrace houses just outside of Kuala Lumpur priced from RM1.75 million each were sold out in just five hours. Rising property prices have been fuelled by low borrowing costs, the continuing promotions by developers and expectations of a recovering economy. More money is also flowing into Asia from developed economies where interest rates are low as investors seek higher returns elsewhere. But this is not unique to Malaysia. Regulators in China, Hong Kong and Singapore have imposed measures to cool their property markets. Zeti also said that "massive" financial literacy programmes would be rolled out as a pre-emptive measure. These would be aimed at those aged below 30 to help them better manage their finances at the start of their careers. PROPERTY developer Sunrise Bhd will launch about RM3 billion worth of property projects next year to boost profit and revenue for the year ending June 2011. The projects are mainly located in the Klang Valley as well as a mixed residential development known as Quintet on 1.94ha in Richmond, a suburb of Vancouver in Canada. Sunrise will launch Phase Two of Quintet within the first quarter of next year. It will comprise 450 residential units with a gross development value (GDV) of C$400 million (RM1.1 billion). Quintet's first phase of 300 residential units were sold out when it was launched this year. "We have been seeking property development work overseas and outside Mont' Kiara to ensure sustainable projects to push for further growth," Sunrise executive chairman Datuk Tong Kooi Ong said after its annual general meeting in Kuala Lumpur yesterday. Locally, the company will launch Solaris Tower located behind the Renaissance Kuala Lumpur Hotel off Jalan Sultan Ismail. It is a two-block strata office development on 1.8 acres of land with a GDV of about RM480 million. Meanwhile, Sunrise's residential projects that will be launched next year are mixed developments comprising condominiums, serviced apartments, a retail area known as MK 20 with a GDV of RM1 billion, and a gated residential development at The Mines with a GDV of RM500 million. "We have a good basket of products for the next launches, we will make sure market demand is met," said Tong. For the year ended June 30 2010, Sunrise reported a 14.2 per cent decline in net profit to RM133.95 million from RM156.18 million previously. Revenue dropped 26.5 per cent to RM590.74 million against RM803.92 million before. Earnings per share was 27.04 sen.
Sunrise said the lower full-year revenue was due to the completion of Mont' Kiara Meridien and substantial completion of 10 Mont' Kiara and Solaris Dutamas in the previous financial year. The residential area construction of 11 Mont' Kiara and 28 Mont' Kiara were on schedule and slated for completion in 2011 and 2013 respectively, it added. PLENITUDE Bhd plans to launch several small-scale property projects worth as much as RM400 million over the next eight months. The builder is taking advantage of a run-up in property prices to launch the seven residential projects that will cover areas in Klang Valley, Johor and Penang. "These properties will be launched during this financial year (ending June 30 2011), and we expect positive contribution to the bottom line over the next few years," said executive chairman Elsie Chua after the company's extraordinary general meeting in Kuala Lumpur yesterday. The company is also planning to launch a big-scale project in Penang in two years' time, which has an estimated gross development value of RM230 million. "The development will mainly comprise landed residential units, of course. There will be some condominiums as well," said Chua. The company, which has more than RM75 million in cash as at June 30 2010, said it will use it as a warchest to fuel expansion, and as such, it has no immediate plans to return more cash to shareholders. Plenitude currently has a policy of returning between 20 and25 per cent of net profits as dividend to shareholders. "That's what the shareholders were asking for, but we need this cash because we know we want to expand. If we cash it out, instead of having our own cash, we start borrowing, then it's bad," said Chua. Zukarnine Shah, a director, added that the deciding factor for not returning the cash as dividend is the company's sustainability. "If we issue out as dividend, shareholders will be happy for sure, but can we sustain? Will we have enough working capital or reserves to acquire valuable land to expand? So, we are trying to keep a balance, but of course, balance is subjective," Zukarnine said. Chua said its landbank, currently at about 720ha, can keep the company busy for the next 10 years. BURSA Malaysia Bhd expects an Islamic real estate investment trust (i-REIT) from the Gulf Cooperation Council (GCC) to be listed on the exchange next year, adding to its three existing i-REITS. It did not identify the issuer, but market speculation is that that it may be Qatar-listed property group Ezdan. News reports as early as May last year indicated that Ezdan was interested in listing an i-REIT made up of Qatar-based assets on Bursa. "I don't think they (the issuer) have decided what they want to put in yet because it is a very big company. In their market, they're one of the top 10 listed companies. The reason they're coming over is because they don't have a REIT framework," Bursa's global head of Islamic markets, Raja Teh Maimunah Raja Abdul Aziz, told reporters after speaking at the Global Islamic Finance Forum in Kuala Lumpur yesterday. Meanwhile, a US-dollar exchange traded fund (ETF) by BNP Paribas Investment Partners may be listed here by year-end or in the first quarter next year. The ETF is pending the Securities Commission's approval, she said.